In Archeofuturism , Guillaume Faye envisions a future world that simultaneously embraces both the latest advances in science and technology, and the values and worldview of Homer and ancient myths. A world that is profoundly inegalitarian, in which might makes right, but in which might now includes the powers of science. This idea of a combination of archaism and futurism struck an instinctive chord with me as soon as I first heard about it, but I didn’t quite know why. So I got the book and read it, and mostly liked it, but I still couldn’t put my finger on just what it was that resonated with me so deeply. Then I remembered where I had heard this before. The year 1994. From out of space comes a runaway planet, hurtling between the Earth and the Moon, unleashing cosmic destruction. Man’s civilization is cast in ruin. Two thousand years later, Earth is reborn . . . A strange new world rises from the old: a world of savagery, super science, and sorcery. But one man bursts his bonds to fight for justice! With his companions Ookla the Mok and Princess Ariel, he pits his strength, his courage, and his fabulous Sunsword against the forces of evil. 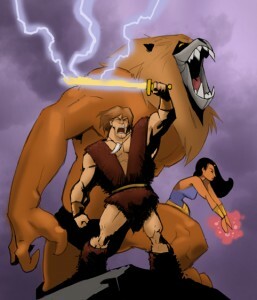 He is Thundarr, the Barbarian! In 1980, I was three years old, and the best thing on television was Thundarr the Barbarian. I began watching it before my memories even begin; it’s as if it has always been with me. I don’t know in what time slot it first aired, but I know that when I was slightly older, it came on very early in the morning every Saturday. I would set an alarm to make sure I got up in time to see it. Thundarr is the sort of cartoon that simply could not get made in 2011. Looking back now, I’m even amazed it got made back in 1980. The character of Thundarr is part John Rambo and part Arnold Schwarzenegger in Conan. He is the predecessor of both, since neither character had been portrayed in film yet, though of course Robert E. Howard’s books were already long well-known. The worldview in Thundarr owes much to Howard, in spirit if not due to direct influence. A world of savagery, super-science, and sorcery. A world in which Hesiod’s and Homer’s distinction between humans and heroes is the law. This is spelled out clearly in the very first episode, “Secret of the Black Pearl,” in which Thundarr must protect a tribe of humans from the evil wizard Gemini. Thundarr is portrayed as superior to the other humans in every way, such that one forgets that he is human himself. He is human, but he is not like them, who are weak and helpless. Thundarr is stronger, bigger, more determined, more clever, though laconic in his speech, and all around superior to the average human of 3994 A.D., so much so that it is reminiscent of the differences between Achilles, Ajax, and Hector, and the thousands of nameless and merely human soldiers of the Iliad. Part of “Secret of the Black Pearl” takes place in the ruins of Manhattan, which Thundarr calls “Manhatt.” The city is shown to be long abandoned, decaying, and overgrown with plants and wildlife, much the way Tyler Durden imagines it will be in Fight Club. At one point Gemini, a wizard with a double-faced head like the Roman god Janus, animates the Statue of Liberty, and Thundarr, Ariel, and Ookla face the giant golem in battle. Lady Liberty, a gift to the young United States from French Freemasons, symbolizing equality and other Enlightenment values, here becomes a fierce monster, shooting fire from its torch and destroying the ruins of Manhatt even more. But Thundarr and his companions are of course triumphant, because in this world there is no equality, and freedom is just another word for strength. One of the most remarkable things about Thundarr, aside from its hyper-masculinity which would be totally unacceptable now, is that it is completely pagan. Thundarr’s two favorite expressions are “Demon Dogs!” and “Lords of Light!” The comfortable lullaby of what William Burroughs called “The One-God Universe” has been replaced by a world of magic and chaos; of monsters, magicians, and scientists; of isolated areas of advanced technology and vast stretches of post-industrial scarcity, just as Guillaume Faye envisions. The god of this world does not hang on a cross, but wields a sword – a sun sword. Magic plays an important role in the world of Thundarr, but there is no morality attached to it. Ariel has magical powers, and so do evil wizards like Gemini and Mindok (a fascinating character who begins as a scientist but then becomes a disembodied and immortal brain, which then learns sorcery in addition to science.) That Ariel is “good” is no guarantee that she is stronger. Quite the contrary, Ariel often finds herself insufficiently strong to handle things by herself, and it is only the cunning and brute strength of Thundarr that saves her from death or capture. Ariel is the feminine counterpart to the hyper-masculine Thundarr, and likewise the kind of character that is not allowed to appear anymore. Modern female characters are almost always portrayed as being smarter than the men around them, whom they tolerate half out of amusement and half of necessity, and in the end the women are shown to have been right all along. Those silly men. One can see Thundarr the Barbarian as a relic of the past, both the ancient past of the Iliad and Beowulf, and the not-so-ancient past of 1980, before political correctness became totally hegemonic in pop culture and art. But, if Guillaume Faye is right, and the earth is headed towards a “convergence of catastrophes,” then we might also see Thundarr as a guide to the post-apocalyptic future that awaits us, the archaic future.